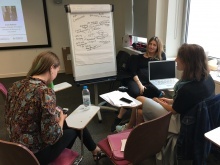 Last month, alongside the Fashion Innovation Agency at the London College of Fashion, we hosted our first ‘Fashathon’ – a two-day fashion and technology hackathon event. 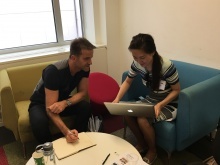 31 fashionistas and technologists came together with the aim to develop new fashion technology ideas into investible business solutions in less than 48 hours. At the beginning of the two-days, the participants pitched their ideas for fashion technologies and as a group voted on the best ideas to move forward with, forming teams with complementary skills sets around these ideas. These ideas were then all pitched at the end of the two days to a panel of mentors, experts and investors. 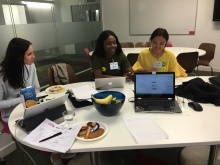 The three winning teams will now have the opportunity to pitch their ideas at Apple Regent Street on 8th November to a select audience from the Fashion Industry. Stealthy Developing a wearable to tackle Vitamin D deficiency in the UK and globally. The wearables will take three different forms; a Hijab pin, a necklace and a bracelet, which will monitor levels of Vitamin D.
Jeremy Mutebi A fashion styling app for men which brings together separate items of clothing from across different brands to create recommended looks/outfits. Bubba Little An interactive clothing range for children which helps stimulate their senses through, for example smell, with a 3D fruit t-shirt collection.